How did you come up with the theme of pets? I just look at the success of some of the books like Babymouse by Jennifer L. Holm, and know kids will love this theme. And wiith the excitement surrounding the new Dr. Seuss book What Pet Should I Get?, I hope this year's theme will tickle the student’s imaginations. What are some of your favorite books about Pets? When I was young I can remember reading books starring animals and they have remained lifetime favorites. Stories like, Charlotte’s Web, Old Yeller, Black Beauty, Sounder, and The Yearling, made a huge impression on me. I also loved Peter Rabbit, which I have in my Magic Library, and Winnie the Pooh. Oh there are so many. But as you know, I am a lover of the classics. Any ideas to get students writing? I think this could be a good writing prompt: Invent a new kind of pet. What would it look like? How would it sound? What would you feed it? For your younger students using poetry as a way to get stories ideas flowing can be a good learning device. I created several short animal poems you can share as examples with your students on my Poetry Fun Playlist. How does the contest work for classrooms? It is the classroom entering, not an individual student. This will be our 3nd year running the contest this way. The classroom will be recognized as the winner. For example "Mrs. P's 3rd Grade Class from Dreamy Valley" Everyone in the class that wins is winning books and prizes for their school. I make the winning story into a video for my YouTube site, so that they can share it with everyone they know. The video story is illustrated by Robin Robinson. http://www.robinillustration.com/ and I also read the story live to the classroom that wins, if they have Skype technology. Who are the judges this year? 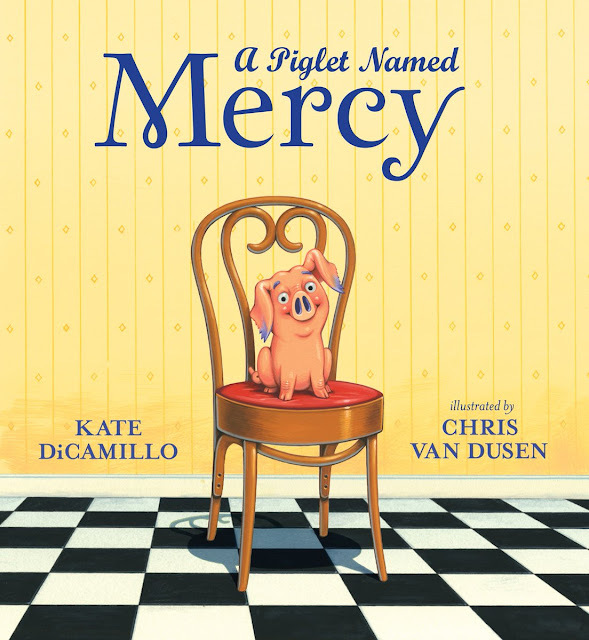 The stories are judged by a panel of celebrity judges that includes Peter H. Reynolds children’s book author, illustrator, bookshop owner and founder of FableVision. I have been participating in Dot Day with classrooms every year, and was so thrilled that he accepted my invitation to be a judge. He is such an advocate for creativity and children of all ages. And I just love his book, The Dot, as it really teachers children that it’s A O. K. to make your unique mark on the world, and that’s what my writing contest is all about. I also act as a judge. It’s my favorite thing in the world to read the contest entries every year! What are the details of the contest? The contest is for classrooms only and is FREE to enter. Parents you can still participate by telling your child's teacher about it. ENTRY DATES: SEPTEMBER 1, 2015. I invite classrooms to write a story on the topic of PETS no less than 250 words and not to exceed 1,000 words. It may be fiction or non-fiction. 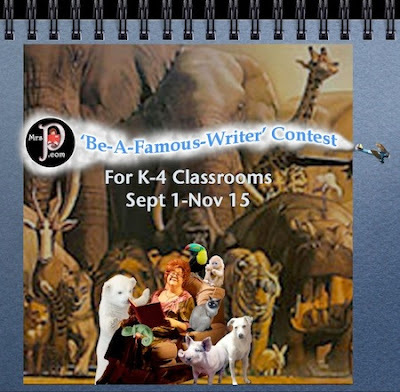 Any classroom from Kindergarten through 4th grade may enter. Just one story per classroom! It can be a collaborative story, or teachers can have their class vote on which child's story to enter. Find all the details at my contest website. My amazing sponsors are providing books galore that will benefit the schools of the winners! Books in every format, real books, digital books and audio books! And what school doesn’t need books? See my prize page for details of what classrooms will win. Meet my sponsors :Mackin Education Resources, Tales2Go, FableVision Learning, & Powell's Books. Thank you for dropping by, Mrs. P!